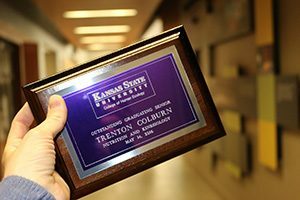 The College of Human Ecology is proud to honor our student commencement speaker and 21 graduating seniors this Friday, May 13, at an awards ceremony in the Kansas State Student Union. Dean John Buckwalter, Assistant Dean Shawna Jordan and Assistant Dean Karen Pence will recognize the outstanding seniors, bestow honor cords and honor program completion certificates, and pay tribute to the student commencement speaker, Vanessa Bowen. The presentation will begin at 4 p.m. in Main and West Ballrooms in the Kansas State Student Union on May 13. A reception will precede the presentation at 3:30 p.m. in K and S Ballrooms. This celebration provides a wonderful opportunity to recognize the College of Human Ecology’s most outstanding scholars and leaders. Beginning in 2016, each academic program could nominate an outstanding senior in one of three categories that the student best exemplified: engagement, leadership, and research and creative scholarship. Nominations came from faculty and staff. Sophia Bachman, nutrition and health with a minor in Spanish. Sophia served as an undergraduate teaching assistant, corresponding secretary for her sorority and a life group leader for Christian Challenge. She completed an internship with the Chamber of Commerce in Salamanca, Spain, which focused on child nutrition and spent two summers at Camp War Eagle as a counselor for underserved youth. She is from Overland Park. Brittany Beneke, family studies and human services with a minor in conflict analysis and trauma studies and a certificate in conflict resolution. Brittany served as an undergraduate research assistant, volunteer and counselor for Operation Military Kids. She interned for the Institute for the Health and Security of Military Families and is a VISTA member with AmeriCorps. Brittany plans to pursue a master’s degree in social work. She is from Salina. Mary Estes, hospitality management with minors in business and leadership. Mary has been president and vice president of the Hospitality Management Society and was a member of Eta Sigma Delta international honor society. She has volunteered at K-State and in the surrounding community with Flint Hills Breadbasket, Community Common Tables, Cats for Cans and the Mayor’s Christmas Tree Lighting. She is from Derby. Lien Hecker, family studies and human services. Lien was a member of the Newman Club, the National Society of Collegiate Scholars and Sigma Alpha Lambda. She has volunteered at the Ashby House to help women and with Domestic Violence Association of Central Kansas, where she also earned an internship. Lien plans to become a Certified Family Life Educator and join the National Council on Family Relationships. She is from Salina. Miranda McMahon, personal financial planning with a minor in business administration. Miranda was a member of the Financial Planning Association, K-State’s Financial Planning Association and the Professional Advantage Program through the College of Business. She is a peer counselor and a member of the Student Advisory Council for Powercat Financial Counseling. Miranda volunteers her financial expertise at Shepard’s Crossing, a local nonprofit. She is from Burrton. Katie Ahern, communication sciences and disorders with a secondary major in gerontology and minor in leadership studies. Katie was vice president of the Silver Key Sophomore Honor Society, membership chair of the Gerontology Club and vice president of communications and president of the Kansas State University Student Foundation. She has found ways to lead in the classroom as well – serving as a lab instructor for CSD 360 and a class leader for LEAD 212 in the School of Leadership Studies. She is from Overland Park. Dylan Bassett, kinesiology. Dylan was scholarship chair, philanthropy chair and community service chair with his fraternity and served as vice president of the Kinesiology Student Association. He was the director of university projects with Mortar Board his senior year and spent his third semester on the Cadaver Dissection team as a leader. During his summers, Dylan is an youth umpire and encourages safety and sportsmanship from his players. He is from Salina. Dryden Baumfalk, nutrition and kinesiology. Dryden was on the executive board of the College of Human Ecology honor society, Kappa Omicron Nu, where he served as initiation ceremony chair. He was also accepted as a College of Human Ecology student ambassador and became the new members selection chair for two years. Dryden was chosen as an inaugural Snyder Leadership Legacy Fellow his senior year. He is from Colby. Emily Betthauser, family studies and human services. Emily has been a Johnson County Ambassador, held a leadership position within her sorority, worked her way up to head lifeguard at the natatorium complex and was a member of the leadership team for Christian Challenge. She served as an AmeriCorps VISTA on the Joining Community Forces initiative and has developed an emergency relief fund for military service members, veterans and their families. She is from Gardner. Kyla Dunn, hospitality management with a minor in business. Kyla was a team lead for the Central CHRIE event in Kansas City and guided her team of six to organize the event. She served as the operations team lead for the Oasis Conference and as the conference evolved into a nonprofit organization, Kyla was asked to join the board of directors. She has led other students in the roles of yearbook editor and programming council officer. She is from De Smet, South Dakota. Cole Foster, personal financial planning with a minor in business. Cole was co-president of the K-State Financial Planning Association and developed two unique fundraisers to benefit the local community. He was a member of a team that won the Financial Planning Association’s national financial planning competition in 2015. Cole spent two years as a lifegroup leader with Christian Challenge. He is from Tecumseh. Erin Kimberling, dietetics. Erin has fulfilled the role of president of the Pre-Physician Assistant Club and president of the Tennis Club for two years. She was a member of the leadership team for Christian Challenge and assistant vice president of finance for her sorority. She organized a blood drive on campus and became a teaching assistant for Human Nutrition. She is from Overland Park. Jacy Lucas, dietetics. Jacy served as president of the Student Dietetic Association her senior year, previously serving as vice president and open house chair. She was the marketing chair for the Kansas Dietetic Association and volunteered with the Boy & Girls Club, the K-State Sports Nutrition program and the American Diabetes Association Camp Planet-D. Jacy was the personal and community enrichment chair for Gamma Phi Beta sorority. She is from Osawatomie. Mary O’Brien, nutritional sciences. Mary participated in K-State PROUD as a member of their executive committee for Student Foundation as student opportunity award allocation chair and vice president of student opportunity awards. She was involved with the Cadaver Dissection team and became a team leader. Mary was an active member of Mortar Board Senior Honor Society and served on the centennial campaign committee. She is from Omaha, Nebraska. Anne Pitts, family and consumer sciences. Anne was a College of Human Ecology Ambassador and took on the role of secretary for the Transfer Ambassadors of K-State. For the Family and Consumer Sciences Education Group, she has been president and open house chair. Anne is a member of both the American Association for Family and Consumer Sciences and the Kansas affiliate. She is from Cheney. Katelyn Turner, apparel marketing with a minor in business. Katelyn has been an Apparel and Textiles Ambassador for the last two years. She was a co-chair of the recent ATID Student Symposium and last year was the producer and event director for the annual Showcase of Excellence. Katelyn was a teaching assistant for an apparel and textiles professional development course. She is from Lenexa. Yi Cao, hospitality management. Yi has participated in internships with the Huangshan Tourism Development Company and Disney Resorts. Through these internships, Yi developed a passion for research and began working with big data analytics as applied to the hospitality industry. She has developed her own study related to a Chinese New Year event utilizing Twitter analytics. She is from Huanshang, China. Trenton Colburn, nutrition and kinesiology. Trenton is the winner of the 2015 biological sciences poster session during the K-State Research forum. He worked in the Clarenburg Cardiorespiratory Physiology Research Lab where he conducted research introducing dietary nitrate supplementation therapy to rats in order learn more about exercise intolerance due to chronic heart failure and as a way to enhance exercise tolerance in both rats and humans. He is from Bellville. Kara Evans, kinesiology. Kara worked in the Human Exercise Research Lab researching maximal oxygen consumption during intense physical activity and the variances between male and female lung capacities. She received an Office of Undergraduate and Creative Inquiry research grant to further her research on the effects of vitamin C on an exercise induced athematic. She is from Woodlands, Texas. Kortney Foley, dietetics. Kourtney is the recipient of an Outstanding Undergraduate Research and Creative Inquiry grant that has enabled her to conduct research into the effects of physical activity and fish oil consumption on those suffering from symptoms related to Raynaud’s. She presented her findings at the Experimental Biology conference in San Diego this spring. She is from Lecompton. Hannah Rice, personal financial planning with a minor in business. Hannah has conducted research with faculty and a doctoral candidate regarding the integration of physical and mental wellness with money and finances. With this research, Hannah coauthored a chapter in a health and wellness book, WholeFIT: Wellness for Life. She was a member of a team that won the Financial Planning Association’s national financial planning competition in 2015, which took over six months of preparation. She is from Peyton, Colorado. This article was posted on Wednesday, May 11, 2016, and is filed under Apparel, Textiles, & Interior Design, Center on Aging, College News, Family Studies & Human Services, Food, Nutrition, Dietetics and Health, Hospitality Management, Institute for the Health and Security of Military Families, Institute of Personal Financial Planning, K-State Family Center, Kinesiology, Sensory Analysis Center.